This one's been on my bucket list (it's a champagne bucket, a-doy) ever since the PhoBlograpHusband and I date-nighted at one of New York Vintners' pizza-and-wine tastings: Come up with a cocktail that goes with pizza. A potable that pairs reliably with a slice or a pie -- why/how is this not a thing? The obvious answer: Because a nice glass of red ain't broke, so why invent something to fix it? Backup answer: Pizza likewise does nicely with crisp Pilsners and not-too-hoppy IPAs. 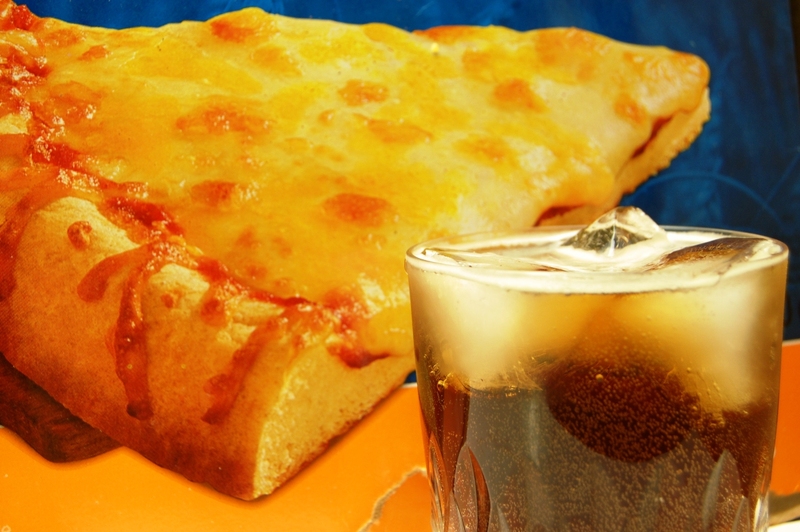 And thirdly, there's something about a pizza cocktail that just doesn't sound quite right, even to a boozehound like me. Is it that cocktails are meant for sipping while pizza's meant for houncing? Do I have some unfounded fear that the cocktail's going to reach room temperature before I'm done eating? (When I eat pizza, I eat lots of pizza.) Is it the bread, maybe, that eating large quantities of crust just doesn't feel right with a liquor accompaniment. Is a liquor/'za pairing all too much grain, like eating the meat and the egg of a chicken at the same meal? WTF IS IT??!? Whatever the seemingly insurmountable conundrum -- and really, for a long while I couldn't think of an entry point for the Pizza Cocktail other than Lambrusco -- I got help big time from the soda aisle at my Montreal supermarket, where I found Brio Chinotto, a quinine-tinged, it's-a-Canadian-thing cola. The label suggests enjoying Brio "simply on ice with a slice of lemon, or add zing by mixing Brio with vodka or rum. Fantastic with pizza!" 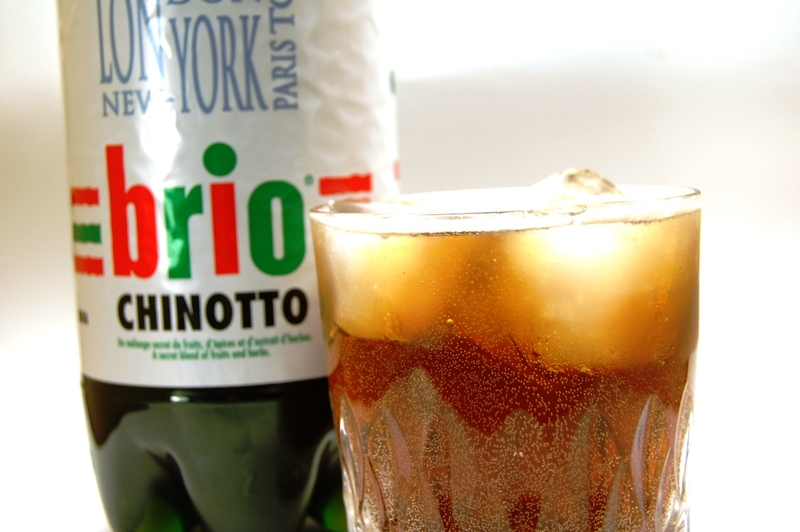 According to my rudimentary Googling, chinotto is a type of cola found in Italy, while Brio is the brand name of that style of cola as sold in Canada; on this blog, a commenter claims that pizza and Brio is a traditional Canadian-Italian weekend treat. So my cocktail would be a highball. Now I've said before that I have no formula, no hard and fast rules for how I develop my recipes, but even I admit that when this one manifested in my skull, I tried to ignore my every instinct, all of which were shouting at me, "Bourbon and gin! Yes, together!" I don't know why. Call me the Long Island Ice Tea Medium. The two vermouths I clearly chose because I want every cocktail I drink to be a Manhattan. All of those ingredients plus Brio equaled something a lot like plain cola (albeit, ahem, a homemade cola). Then came the homemade oregano shrub syrup. I'll pause for a moment while you roll your eyes at the dreadful of-course-oregano-ness of it all (gosh, Rose, how about a pepperoni rind garnish? pfffttt...) but it did make the difference. Sean described the result as "an herbaceous cream soda and a stiff drink at the same time." Not even a 99-cent slice can beat that. Combine liquors and syrup in an ice-filled cocktail shaker and shake vigorously. 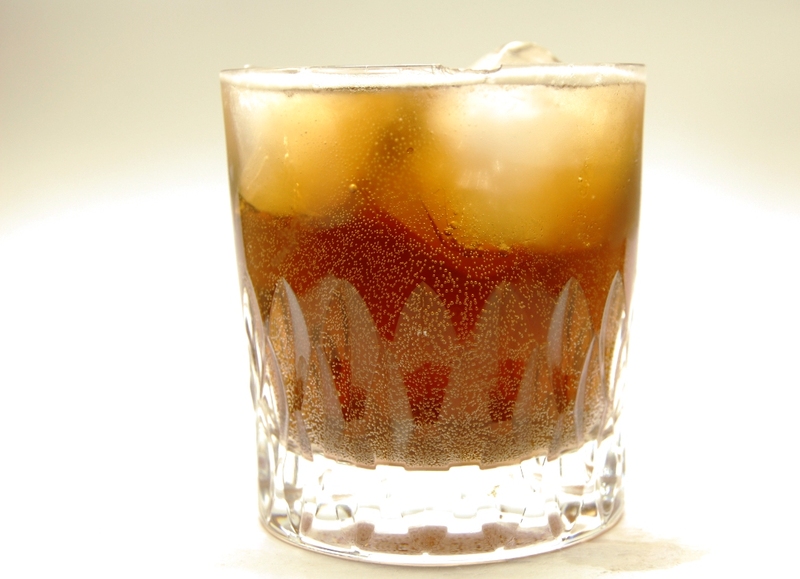 Strain into ice-filled highball. Top with Brio Chinotto. My recipe for oregano shrub syrup, paraphrasing the raspberry shrub syrup recipe published in Eric Felten's How's Your Drink? : Whisk a cup each of water and sugar together at a boil. Reduce heat for a few minutes, add a cup of fresh oregano (I'd tear up the leaves beforehand) and stir occasionally for about 10 minutes. Add 2 cups white wine vinegar and bring to a boil for two minutes. Strain, cool and refrigerate or freeze (it lasts several months if you do the latter).